Drop at comb 1.5" 1.5"
Drop at Monte Carlo 1.75" 1.75"
Drop at heel 2.5" 2.5"
Cast at heel 0.25" 0.25"
Cast at toe 0.5" 0.5"
Breech to comb 7" 7"
Responsive, perfectly balanced and engineered to fit a woman’s anatomy, the Syren Tempio is a great bird gun for female hunters. When a shotgun fits perfectly, the shooter will feel less recoil and be able to shoot accurately. That’s why the Syren Tempio has been designed specifically for women. Every stock dimension was carefully designed to fit the female anatomy. Particular attention has been given to the balance and weight of the shotgun to make it easy to handle – especially in tight cover. The elegant action features a classic scroll and bouquet engraving motif. The wood is a hand finished deluxe grade of Turkish Walnut with checkering that incorporates a small flourish of carved roses to compliment the engraving. 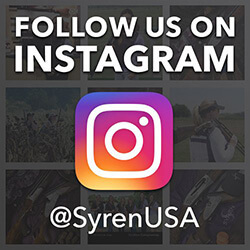 With all of these features and more, the Syren Tempio is the perfect companion for the American huntress.